The Avian are one of the seven playable races in Starbound, and one of the six races entrusted with an Ancient artifact. A birdlike race of humanoids hailing from the planet Avos, their stone structures, simple clothing, deeply-religious nature and rather simplistic battle tactics (primarily consisting of "overwhelm the enemy with thousands of disposable soldiers") make them seem primitive at first glance. But the Avian are very intelligent, and anyone brave or foolish enough to venture into an Avian temple or tomb will find examples of advanced -and deadly- technology, powered by Avolite crystals. These enigmatic power sources are mined solely by the Stargazer priests on their homeworld, and power everything from simple lights to spaceships capable of interstellar travel. Avian culture is centered around the worship of Kluex, the "Winged God of the Aether". According to their religion, the Avian once existed outside the mortal plane alongside their god, but grew jealous of the mortals' pleasures. The Avians crossed into the material world, an act punished by stripping them of their ethereal wings, dooming them to be forever flightless. An Avian can only be reunited with Kluex by shedding their mortal body while keeping the truest of faith in their hearts. Ceremonies to achieve this state of pure being include ritualistic sacrifices of captured enemies, and an elaborate procession that culminates in the most devout, chosen by the priests, climbing a tall tower and taking a leap of faith, their spirit breaking free of their mortal prison and flying into the Aether, as their now-discarded body plummets to the ground below. This bloody theology does not sit well with all Avians however, and a growing number have rejected the words of the Stargazers and the divinity of Kluex. Calling themselves "Grounded", they have taken to the stars and formed their own colonies. Some have crafted terrestrial flying ships and make their lives in piracy, and many others have joined multi-racial organizations like the Terrene Protectorate. As with the other player races, Avian characters are given a set of uniquely-styled Armors, their own Ship type (with included Pet), and two unique Mech bodies. The Avian equipment has a distinctly ancient South American look to it, though their stats are the same for all other race's equipment at the same Tier. An Avian player has four sets of race-specific Starter Clothing to choose from in the Character Creator, plus the standard-issue Protectorate T-Shirt and Protectorate Vest. These items have no defensive capabilities whatsoever. These four sets are also used to clothe randomly-generated Avian NPC villagers. There are a number of Avian-related Cosmetic Armors to be found scattered across the universe, usually in Avian-themed Dungeons, but sometimes in random/Biome chests. Like the Starter Clothing, these have no defensive capabilities, but let the player customize their character's appearance. The Avian Ship blends high technology with the gold-and-crystals style of Avian temples. Its size can be expanded by obtaining more Crew members, which allows the player to buy a higher-class Ship Licence from Penguin Pete for every two more Crew members. Alternately, the player can buy counterfeit licenses from Penguin Bay: these licenses are expensive, but do not have crew requirements attached to them. Once upgraded to the Condor Class (the largest Ship class), the Avian ship resembles a pyramid, with several massive chambers. Avian ship pets are Bunnies, coming in one of ten different colors/patterns chosen at random. Avian player-characters have the ability to craft two unique Mech body types. The Champion-00 Mech Body is the first Mech body the player will obtain, by completing Dr. Akaggy's "Test Drive" quest at the Outpost and unlocking the ability to use Mechs. Its advanced version, the Champion Mech Body, is obtained by completing Akaggy's later "Advanced Test Drive" quest. Avian NPCs are very common. Lone Avian Merchants can pop up on nearly any world (both through normal planetary generation and temporarily as part of a Quest), and spaceships and space stations may have Avian crew. Avian can appear as NPCs in mixed-race planetary Microdungeons such as Savannah settlements and Volcanic Foundries. The following are some randomly generated, in-game names of Avian NPCs. Avian villages and dungeons can be found on all planet types that can have surface-level full-sized dungeons except for Lush (aka "starter") planets. They are most likely to appear on Jungle planets over any other type. Avian structures are mostly stone-and-brick constructions, often covered in hieroglyphs and lit with flames and Crystal Torches. The Grounded villages are more modern, built atop large sandstone-brick foundations and with larger living spaces. The "Native" villages are mainly small humble huts clustered around lavish, ornate ritual towers and pyramids. Temples and tombs are mazelike, reaching deep underground and heavily guarded. Tombs are laden with deadly traps for the unwary. The Quest to find the Avian Artifact is the third of the five Artifact Quests the player must undertake. This two-part hunt first involves finding Avian decor items and scanning them, giving Esther data to locate the Artifact's whereabouts. Once she has enough data, the player can travel directly to the Great Sovereign Temple to retrieve it. Once the Avian Artifact has been retrieved, Tonauac will set up camp at the Outpost near the Ark. Speaking to him will grant the player a blessing in the form of a Buff that lasts 30 minutes, the type of buff changing every 24 hours. A variety of Avian Tenants can be summoned by placing a Colony Deed in a suitably-furnished room. These Tenants will always be Avian regardless of whatever racial furniture is placed in the room, with one exceptions. 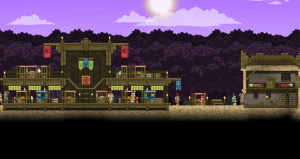 The Oasis Merchant has a 50/50 chance of being an Avian or a Floran. Avian feature in a good number of Codex books, both written by Avian and by other races. The player can find fossilized remains of Avian underground on most planets by successfully completing a fossil mini-game. The prizes for completion are randomized, so it may take a lot of tries to obtain even a single piece. Once a complete set of skull, torso and legs has been collected, they can be placed in a Medium Fossil Display, forming a complete Avian skeleton to be put on display as a decor item. This also completes entry #12 in the Fossil Collections Library. Once the skeleton and display have been combined, they cannot be disassembled. The player may also find the Avian Skull Mask Cosmetic Armor piece in Bone Chests scattered throughout Bone Biomes. The Avian did not undergo many changes in the Beta versions of the game from their early iterations, at least as far as the direct gameplay elements are concerned. The majority of what changed was in Lore that was ultimately discarded in the "Giraffe" updates. Originally, there were Avian Dungeons that resembled tall towers inhabited by guards. At the top of these towers, there would be two unarmed Avians standing at the edge of the Tower. Speaking to them suggested that they were going to jump off. If the player attacked these Avians, they would thank the player before jumping off the tower. Since they couldn't take fall damage, these Avians wouldn't die when hitting the ground. Avian intro scene from the (very) early build of the game.